Several testers welcomed the breathable upper of the Saucony Peregrin 8. According to some people, the midsole was able to deliver comfort and support to the underfoot. The grip of the outsole unit’s traction lugs proved to be efficient, a few runners noted. According to a few users, the shoe feels lighter compared to other trail shoes. Several runners mentioned that the Peregrin 8 offers reliable underfoot protection for trail running. Most runners didn’t like the removal of the rock plate which served as a protective layer against sharp surfaces and debris. A few mentioned that the midfoot area is too snug. The Saucony Peregrine 8 is not durable. The response for the Saucony Peregrine 8 is mixed. It is true that more than several people were happy with the underfoot platform, the outsole configuration, and the well-ventilated upper. But a lot of people had some gripes with this trail running shoe, as well. They felt that it was too narrow for their liking. They also had something to say about its limited color schemes, the unfortunate removal of the rock plate, and the hefty weight. It’s a conflict-ridden update for a well-known series. The peregrine is renowned for its speed, reaching over 200 mph during its characteristic high-speed dive, making it the fastest member of the animal kingdom and the Saucony Peregrine 8 live up to their namesake’s reputation. A neutral trail running shoe, within aggressive talon-like outside tread, you won’t think twice about taking on tough technical terrain. 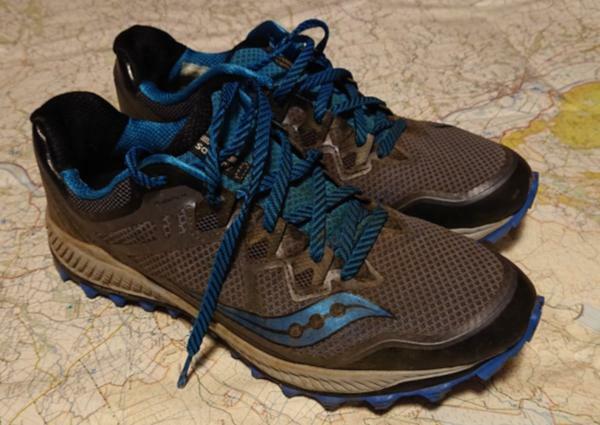 These shoes offered me confidence on some of North Wales’ toughest trails and got me through the first 100 miles without blisters, sores or chafing. A great shoe from the start! The design and structure of the shoe are great with sturdy laces that could do with being a touch longer but do the job. I found it breathable for a trail shoe with a mixture of solid and mesh material. The build quality is good offering a light but secure cradling feeling to the foot, with ample toe protection and nice cushioning around the heel. One slight drawback was that they can feel a little clunky due to the epic grip, but you soon get used to it. I was excited to get running in them as soon as they were out of the box. They look good - not too flashy in black, grey and blue. After many puddles, bogs and dusty trails the shoes still display rugged good looks. The PWRTRAC™ sole is impressive to look at and fills you with confidence for when the terrain gets hard; it certainly takes a beating. They felt good; not too heavy, comfortable and stable. The fit was spot on as it offered slightly more room than the Peregrine 7. A bonus was the flexibility which was unusual but welcome in a trail shoe. The cushioning was soft but not spongy. Once running, the shoes continued to please. I ran from road to trail in the Snowdonia Marathon and found them to be a great shoe for trail marathons. I would highly recommend as they are not as harsh as fell shoes when on hard ground and offered a bit of a road shoe feel when needed. This shoe handles grass, road, hard packed trails and hills really well. I ran in them all day with no pain in my legs. I noticed that there wasn’t a rock plate inside, but that didn’t bother me and haven’t noticed any problems with foot stability when running. After 100 miles plus of training use, I haven’t noticed any wear on the outside at all. They still look and feel very strong. One potential drawback is the grip (although fine for the vast majority). If you hit play, you may notice the weight of the shoe. Depending on your gait, you may find that the sole catches on your calves and this is worth considering before you buy. Having run in Innov8 X Talon in similar terrain, I found the lugs collected much more clay deposit in the Peregrines. I also found that the water drainage in the Peregrines can be a bit hit and miss and they can feel heavy when wet. However, they clean up quickly and easily, and in dry and damp conditions they are hard to beat. The shoe offers confidence for road and trail mixed-use running. They are true to size, not too wide and not too tight. After trying on many size 10s from many different brands and feeling frustrated by the differences, the Peregrines remain consistent in their sizing. Overall I found security of the upper to be very good and hold my foot comfortably, with very little give even when pushing on steep, technical terrain with varying camber, hopping rock to rock and cornering hard. With an amazing combination of protection, traction, cushioning and flexibility, this shoe holds its own on a variety of trail surfaces from smooth dirt to extremely rocky and rugged. Our wear-testers liked it most on more technical trails that featured unpredictable, off-camber terrain, mostly because it allowed the grippy outsole to be utilized to the fullest. The Saucony Peregrine 8 is a running shoe that’s made for those who have neutral pronation. It is optimized for the trails. It makes use of an aggressive outsole design to deliver grip on a variety of surfaces. Multidirectional gripping lugs heighten traction when tackling ascents and descents. Saucony’s PWRFOAM is the primary cushioning unit of this iteration in the series. It boasts a responsive ride in a shock-attenuating package. Moreover, it has an EVERUN topsole for an additional rebound capacity with each step. It is worth noting that the rock plate that has graced this model’s predecessors has been removed. The upper unit of the Peregrine 8 has a mesh construction that is open. It’s vastly different from the 7th version where the façade is tightly knit. And though printed overlays make up its reinforcement system, their presence in the instep is bolstered by stitches. The Saucony Peregrine 8 was designed using the standard measurements. It follows the preferences of consumers regarding the sizing scheme. The available widths are B – Medium for the ladies’ version and D – Medium for the men’s. Its foot-shaped platform mimics the natural shape of the human foot. PWRTRAC is a rubber material that’s designed to be sticky. Its purpose is to shield the rest of the sole unit from the debilitating nature of the trails. It also provides surface traction, which is vital to any running shoe. Gripping lugs heighten the grip of the Saucony Peregrine 8 on various surfaces. They face multiple directions and are aggressive in prominence, having 6 millimeters in height. Flex grooves are fashioned all over the sole unit. They allow the wearer to bend the metatarsals naturally for a more agreeable stride. PWRFOAM is the central cushioning unit of the Saucony Peregrine 8. It offers a springy ride that’s also filled with shock-attenuating power. Moreover, its sturdy configuration doesn’t allow it to break down or sag easily. Placed on top of the thicker foam is a full-length EVERUN material. Its goal is to enable a springy ride and energy return when striking and taking off of the ground. This midsole material is also used in the Ride 10 shoe from Saucony. The mesh material of the Saucony Peregrine 8 has an open construction. It allows environmental air to enter the foot-chamber and maintain a cool and dry experience for the foot. The overlay system is made using Flex Film. This thin layer covers critical areas that affect the overall snugness of the coverage. It works in conjunction with the shoelaces to deliver a snug yet customizable fit. The instep part has stitched reinforcements to heighten the efficacy of the overlays and to improve durability. The forefoot section has a rubberized exterior film. It aims to protect the toes from any debris or surfaces that may cause pain or injury. RUNDRY is a collar lining that is designed to be soft and smooth against the skin. It has anti-moisture properties that stave off odor-causing sweat or wetness. Holding the back of the foot in place is a heel counter. It’s an add-on that prevents shaky in-shoe experiences and accidental shoe-removals.